You often hear of MMA fighters causing problems when someone looks at them the wrong way or harasses a friend, but in this case, things happened a little differently. Jessamyn Duke and Shayna Baszler, two of Ronda Rousey’s “Four Horsewomen” stablemates, had a run-in of their own last September, a source close to The Sports Post revealed. The two fighters confirmed the details. It started after a catch-wrestling seminar taught by Josh Barnett at CSW to raise money for Colleen Schneider and Lauren Anderson, who won the FILA Pankration World Team Trials the month before and were raising money to represent the United States at the FILA Pankration World Championships in Hungary. Duke and Baszler attended as guests to support their teammates, who both ultimately won gold. A superfan of Duke and Baszler’s showed up to the seminar. Although she was in a wheelchair and therefore couldn’t participate, she paid the seminar fee just to hang out and meet two of her favorite fighters. “Afterwards, we took special care to hang out with her and talk to her and take pictures, and sign some stuff,” Baszler recalled. After the seminar was over and their fan was waiting for her ride, Baszler and Duke, along with their teammate Justin Pierpoint, hung out with her while she waited for her ride. Even though her fan said she could wait alone, they decided not to leave her in a parking lot in the middle of LA by herself. The girl’s ride kept saying they were on their on their way, so everyone continued waiting as the sun set and temperature fell. The man driving, decked in gang and Satan tattoos, including devil horns tattooed on his forehead, said, “I don’t need to answer to you, I’m a grown-a** man! Who are you?! Who are you? !” After asking Baszler why she didn’t arrange a ride for her new friend—which she said she would’ve done had she not been repeatedly told that they were on their way—he continued mouthing off. “He just said, ‘You can’t disrespect us! You don’t know my life!’ Then he turned to the girl he was there to pick up and said, ‘Your friends are being a**holes. You’re going to have to find your own way home,’” Baszler said. That’s when the The Queen of Spades started backpedaling, stating that she shouldn’t have said anything, points out that her friend is hungry and needs to go to the bathroom, and trying to convince them to take her home. They refused, so Baszler stepped in the way so the car door couldn’t shut. “I said, ‘Listen, you’re not going to leave a girl in a wheelchair here in the middle of LA,’” she said. While Baszler grappled with the man in the doorway of the Chevy Cavalier, smashing him up against the car, Duke tried to step in the middle to break things up. “I’m saying, ‘everybody knock it off! This is ridiculous. Just stop!’ I’m facing Shayna and the guy has his back against the door, Shayna is pressing him there, and he’s just clawing and smacking and acting like an idiot,” Duke said. Duke then saw the woman walking around from the driver’s side door around the back of the car carrying a short baseball bat in her hand. “I had this moment where I’m like, ‘is she just going to threaten with this? Is she going to try to scare everyone?’ and I’m assessing that she has this and I don’t say anything,” Duke said. Then she saw the woman raise the bat straight at the back of Baszler’s head. Baszler had her back to the woman, so Duke reached up and wrapped her arm around Baszler’s head, like she was cradling it. “I thought it was the guy grabbing my head to pull me down and knee me. In the scuffle, I thought that’s what was happening,” Baszler said. (Oddly enough, this street battle took place not long after Duke broke her hand—so she was shielding Baszler’s head with a broken hand.) Then, instead of hitting Baszler on the head, the woman cracked her across the lower back a few times. “I thought she was punching me, to be honest with you,” Baszler said. Duke reacted fast with a head shuck by, and as soon as she cleared her teammate, the woman hit her on the head with a baseball bat. “I got hit so hard that I remember my head turning and looking at the buildings across the street and just looking at them … I got hit so hard by that, and I shook it off, and I tried to turn back and look at her and I got hit again in the head. I didn’t fall down, I didn’t go down, but I remember I looked around the parking lot and now I was out in the middle of the street like a good 10 feet away [from where I was], so I think I staggered and got over there before I got my wits back about me,” Duke said. “I saw Jess get cracked in the head with a metal baseball bat about three or four times,” Baszler said. Duke remembered getting hit in the arm, shoulder, and ribs as well—at least 10 times in all. Once she got her wits about her, Duke approached the girl. After completing the snake disarm, Duke had the bat close to her thighs. She kneed the girl and lifted her off the ground, and then saw Baszler out of her peripheral vision. Baszler lifted the girl up, and the girl lost her grip on Duke’s shirt and the bat, ripping Duke’s shirt half off in the process. Baszler took her down to the ground, mounted her, held her in a gift wrap, and meanly ground her face into the asphalt. As anyone who’s ever grappled knows, you’d have to hold the choke for a very long time to kill someone, but Baszler only put the girl to sleep for about a second and then let her go. The guy scooped her up, they both run towards the car, with the girl in the back seat and the guy in the driver’s seat, bleeding. “We let them drive off and we shouldn’t have. 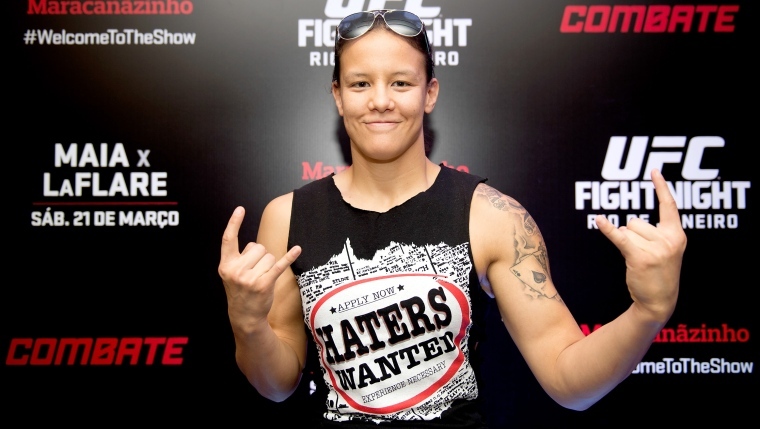 We should’ve held them and called the cops,” Baszler said. They did call the police, though, and their friend who came to the seminar shared information about the perpetrators to the police. After the police left, they called Barnett and Erik Paulson to explain what happened. “Sometimes we’ll still be sitting around and I’ll say, ‘can you believe that you got hit in the head with a f***ing baseball bat?’ Thank god we train and we know how to be in a fight. There are a lot of women that will take a weekend self defense course or something, but they are not going to know how to keep their wits about them when they get their bell rung and hit with a bat and almost knocked out,” Baszler said. Duke had to get seven stitches, trying to explain to the ER nurses that this was an unusual situation (but that her hand was already broken from a different fight). Although the perpetrators of the fight haven’t been charged yet (they’re homeless, making it harder for police to find them), they will face charges of assault with a deadly weapon and grave bodily injury. The girl’s caretaker faces obstruction of justice charges for refusing to give away information about the perpetrators. Another silver lining: about three and a half months after the incident, the girl was removed from her house and placed in a new home. But here’s a pro tip for would-be wanna-be street thugs: Don’t start a fight when you’re outnumbered and your opponents are decked out in UFC gear and standing outside of a gym that says “Combat Submission Wrestling and Mixed Martial Arts.” If you’re lucky, they’ll show the same level of restraint Duke, Baszler, and Pierpoint did—but that’s not guaranteed. Monaco Bow Out of UCL; What’s Next? DPD: Cole is Close; Kershaw Running Unopposed? NHL Playoff Predictions, Part 2: Finally Washington’s Time?